Let me confess from the beginning that I am an introvert. I have done the Myers-Briggs personality assessment twice, and both times I scored almost as far to the introvert end of the spectrum as it is possible to score. And yet when I mentioned this (or mentioned this book) to several people that I haven't known for very long, they were shocked to learn that I am an introvert. So I guess that I am an introvert who has learned to "pass" in this extroverted society in which we live. I heard this author interviewed twice this spring on CBC radio, and knew that I would have to read her book. I forwarded a link to one of the interviews to an introverted high school student that I know - she has an extroverted grandmother who has, frequently, pushed both of us to speak in a group when we would rather listen, absorb, reflect, and when we have something that we would like to share we will. But please don't force us to speak if we don't have anything that we consider valuable to share! Reading this book, I saw myself reflected on every page. So that is why I feel that way! That's what's going on! I have also caught myself being much more aware of my introverted moments. I am very sensitive to noises - someone's cell phone rings and I jump; I was doing a phone interview along with my boss this morning and the speaker phone volume was a bit too loud for me to be comfortable with; the kids playing at the back of the church during the sermon drove me crazy. But I can accept that about myself now. The book talks about coping strategies for introverts; since our society really is geared towards extroverts (the subtitle of the book is The Power of Introverts in a World that Can't Stop Talking). It is OK to give myself permission to stay home if I don't feel like going out and socializing. Introverts can act like extroverts at times (my recent experiences as being mistaken for an extrovert prove that point), but it is important to carve out time to recharge by being alone or taking part in solitary activities. I especially appreciated the chapter sub-titled Public Speaking for Introverts, since I am terrified of public speaking. I already partially overcame my fear by doing a lot of public speaking (teaching, preaching etc) in Swahili (not my first language) while living in Tanzania. I knew that people would be surprised enough to hear a white girl speaking Swahili fluently that they would be more forgiving about the content of what I was saying! But this book had some more tips for me - the more passionate I am about a topic, the easier it will be to speak about it (I think that I already had a sense of this); the more prepared I am, the better (don't expect myself to be able to speak "off the cuff"); and treat each public speaking expectation as a personal project - dig, create, and relish the challenge. At the same time, this book helped me to understand my extroverted co-workers, friends, acquaintances better. They aren't just speaking to hear their own voice. Maybe silence and stillness are as scary to them as loudness and busy-ness are to me. 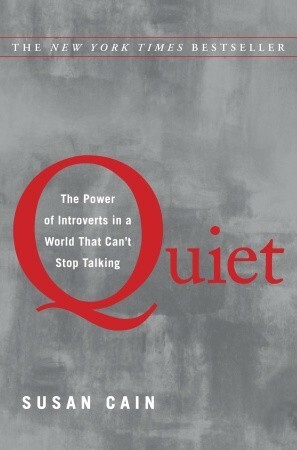 I do think that this book is good reading for everyone, introvert or extrovert. Introverts - as it is written by an introvert, it will help you to understand yourself better and how you interact with the world around you. Extroverts - it will help you understand your introverted family members, friends, and co-workers better, as well as how they relate to the world around them (including you). ... I really enjoyed your post on this one, and laughed aloud since I immediately knew both the introverted high school student and the grandmother. Why yes, Dada S, you do know the student and the grandmother! The student wants to borrow this book from me when she gets home from England (I'm planning to include it when I give her back her Hunger Games books) - we are still working on trying to persuade her grandmother to read it!